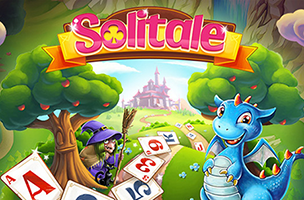 Fashland developer Gamegos has announced the launch of its newest Facebook game, and its first puzzle experience: Solitale. The title is a dragon-themed solitaire game, which challenges players to defeat an evil witch through more than 100 levels of Tri Peaks-style solitaire. In each level, players are presented with a different layout of cards, and are given a draw pile and one active card at the bottom of the screen. Players clear the board by clicking on cards one number higher or lower than the active card. When players clear five cards in a row (that is, without drawing another card from the deck), they receive bonuses from a dragon egg. These bonuses typically add additional cards to the draw pile, making levels easier to complete. Regardless of the layout, players are asked to clear the witch’s cards from the board, which are specifically marked. That is, players won’t have to clear 100 percent of the cards from the board in order to successfully complete stages. Players earn up to three stars on each level, depending on their final score, and can compare their scores with their friends on level-specific leaderboards. Gamers can repeat stages to increase their high scores or earn more stars, but failing a level (running out of cards before clearing the key cards) costs a life. Lives recharge automatically over time, or can be purchased with real money. Users earn coins while playing, and can spend these coins on additional deck cards, wild cards and more. Elsewhere, premium currency can be spent on an increased maximum lives allowance, permanent coin multipliers, and the use of an “undo” button, among other options. Solitale is available to play for free on Facebook, and has climbed to over 10,000 players. Check back soon to follow Solitale on AppData, our tracking platform for mobile and social apps and developers.